You have two cows. Your slaves tend the cows, and you drink the milk, write philosophy, and vote on things. You think this is a perfect democracy. You have no cows. Yet. You have one cow. It is incredibly shiny and everyone keeps trying to steal it. You long for a quiet life and some actual milk. You have two cows. You build them a very fancy cowshed and sell aesthetically pleasing pots of artisanal milk to passers-by at extortionate prices. You have two cows. You sacrifice them and try to prognosticate the future. The future turns out to involve you having no cows and no milk. You have two cows. You vote for the expropriation of cows from the wealthy. The resulting civil war kills half the cows in your city-state. You end up with two cows again. You have two cows. You end up going to war for nearly a quarter of a century. You are surprised to find on your return that other people are drinking the milk. You kill them. You have two cows. They bear your children. You have two cows. They write beautiful romantic poetry for each other. You have two cows. Everyone else thinks your cows are rubbish barbarian cows. You take all their cows as well just to prove a point. You keep going to more and more farms and taking their cows, only stopping when your cows refuse to swim across yet another river. You name seventy cowsheds after yourself along the way for no especially good reason. After your death, there are violent struggles over who owns the herd that last for generations. Your name will live forever amongst cowherds. You have two cows and dreams of freedom. 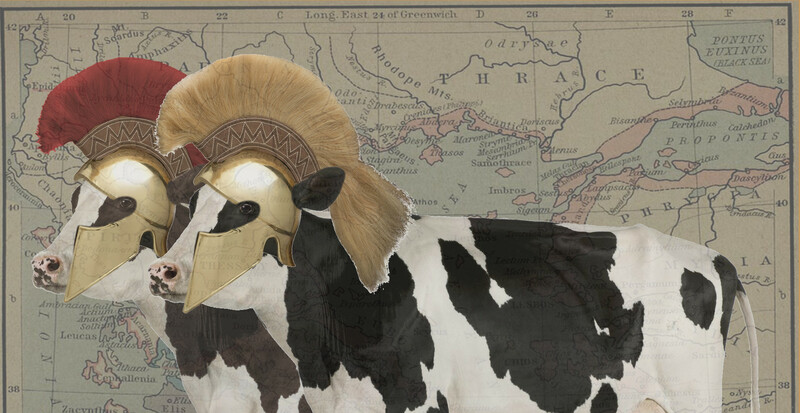 The Spartans come - but at least they only take the cows. You have two cows. Your king makes you build a giant stone cowshed for them. You have four cows. Everyone else only has two. This gives you the right and ability to rule a state. And lots of milk. You have two cows. You try and get them to have a wrestling match. You have two cows. The satrap officially has a right to the milk. The satrap has no idea who or where you are. You drink the milk. You have two cows. Your philosopher-king tells you what to do with the milk. He is right. You have no cows. You go to Messenia and spear helots until they give you milk. You have two cows. You put them in a bathtub to see how much the water rises by. You are so excited about the result that you forget about the milk. 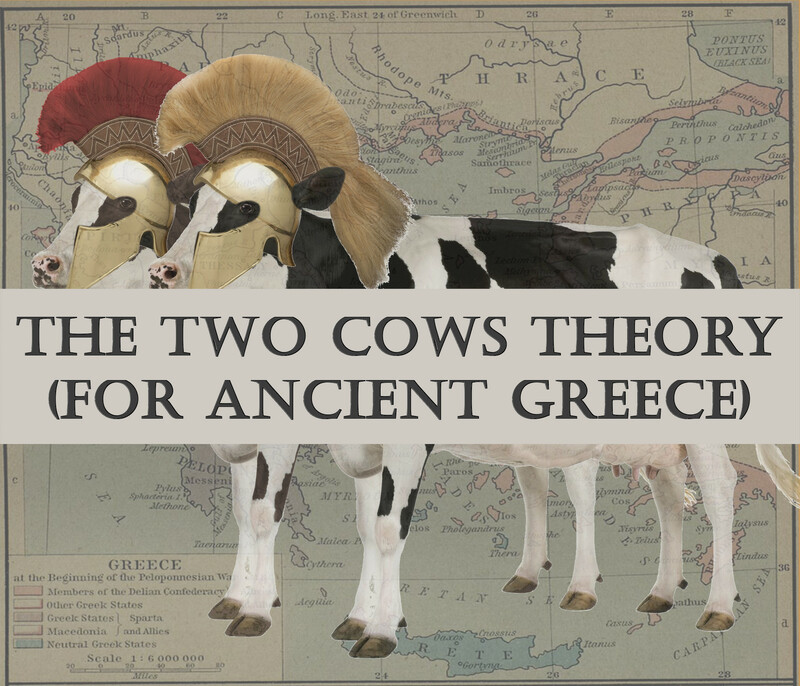 You have one cow and everyone else in Greece has two. This feels unfair, so you sell the milk to the Persians to annoy them. It doesn’t help. You have two cows. You, and they, have a complete disdain for bulls. You are given a large wooden cow. This goes badly for you. So there you have it. Did you enjoy this confused wander through the world of ancient Greece? Comment below and let us know! We may fire up the time machine again sometime soon... see you then! * What happened to Cow Forty-Three is a matter of dispute among scholars. While we read of letters, documents, and a number of books in George R.R. Martin’s A Song of Ice and Fire (ASOIAF), the television adaptation Game of Thrones (GoT) allows us to peruse their physical incarnations. We know that in a pseudo-Medieval setting books are important for a number of reasons, not the least being their expense and effort to produce; however, they also play crucial roles in the ASOIAF/GoT storyline. We know that Tyrion is a voracious reader (especially of dragon-related material), that Samwell Tarly is sent to the Citadel partly because Castle Black’s library is minimal at best, and that whatever Prince Rhaegar Targaryen read in a certain ancient book from Asshai dramatically influenced his decision to pursue military prowess and statecraft. The show itself frames its events through a work of recent history being produced at the Citadel, where the gyroscopic chandeliers match the decorations around the sun in the opening credit sequence. 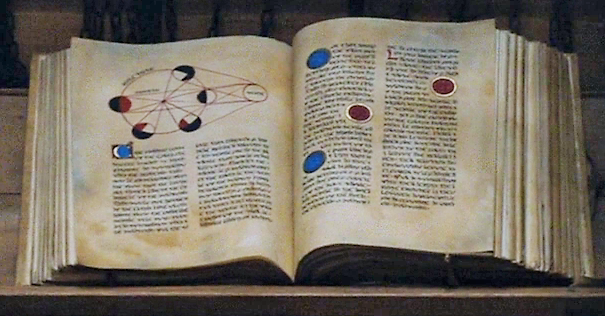 A closer look at the props used on the show and the study of their writing styles (the field of history known as palaeography) can provide valuable insights about the wider world, state of literacy, and dissemination of knowledge in Westeros. While any books, letters, or handwriting visible onscreen have an admitted narrative purpose to fulfill, their appearance and contexts also offer valuable background information. As Westeros is in many respects Western Medieval Europe (more specifically, the British Isles) with dragons, comparisons with real world Medieval and Early Modern scripts will help elucidate their fictional counterparts in a number of case studies. From this information we can draw conclusions regarding the contents and dates of the books and letters in the series and by extension, Westerosi awareness of the Others/White Walkers, dragons, and other often-scoffed at supernatural elements. The illumination, use of colored ink, and illustrations along the bottom of the pages mark this volume as a relatively expensive, luxury production. The script is a variety of 'Gothic textura', typical of Western European Mid to Late Medieval manuscripts (c. 1150+ AD). The size of the hand, word and line spacing, and wide margins, along with the creamy, unblemished parchment further contribute to its high status, presumably intended to be read (possibly aloud given pre-modern reading practices, well marked sections and the size of the script), gifted, and/or flaunted by a wealthy patron. The frequent, detailed, and large in-set pictures in this manuscript also indicate a fairly high status production. The script is very readable to a modern audience, as it has much in common with a Renaissance or Early Modern 'humanistic minuscule' hand. Humanist minuscule emulated the Early Medieval 'Caroline minuscule' that was found in manuscripts containing Classical works. This represented a conscious (and anachronistic) attempt to reclaim the knowledge and aesthetics of ancient Rome, getting rid of the Gothic (sometimes called “blackletter” for the wide, well-inked strokes) letter forms of the mid to late Middle Ages. Assuming Westerosi palaeography even loosely follows that of Western Europe, this manuscript must therefore be a quite recent production, likely even more so than the copy of Legends. Note the use of Arabic numeral 18. We have no idea what kind of number system is in use in Westeros or whether such a system, like Arabic numerals in early Renaissance Europe, was eventually adapted from other regions. Was there also an older, fustier system comparable to Roman numerals? If so, such numbering, like the Early Modern script of the manuscript, suggests a recent origin or at least recent copying. How much do the characters in GoT/ASOIAF know about the physics that govern their world? Are the seasons really due to the planet’s astronomical orbit, or are they the result of something more mystical? We simply don’t know at this point in the series, but we do know that someone is willing to devote quite a bit of gold leaf and colored ink to finding out! 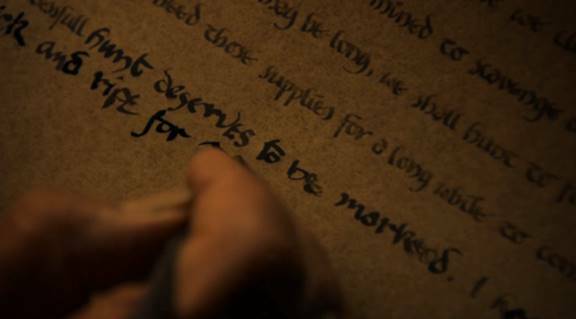 Ned’s handwriting has more in common with the Humanist minuscule from the dragonglass book Sam finds at the citadel than the stiffer textura of Legends. Given that and the subsequent scripts, we can assume these humanistic tendencies represent a later script development in Westeros as well as our world. Again, an easy to read minuscule hand. 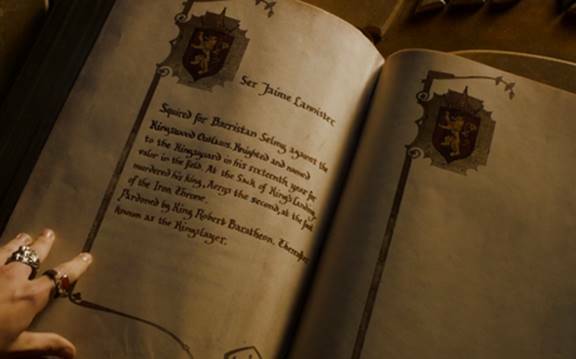 If we believe that the entries in the Book of Brothers (which chronicles the members and deeds of the Kingsguard) are written by the Kingsguard's current commander, then Westerosi (noble) knights have unparalleled penmanship. 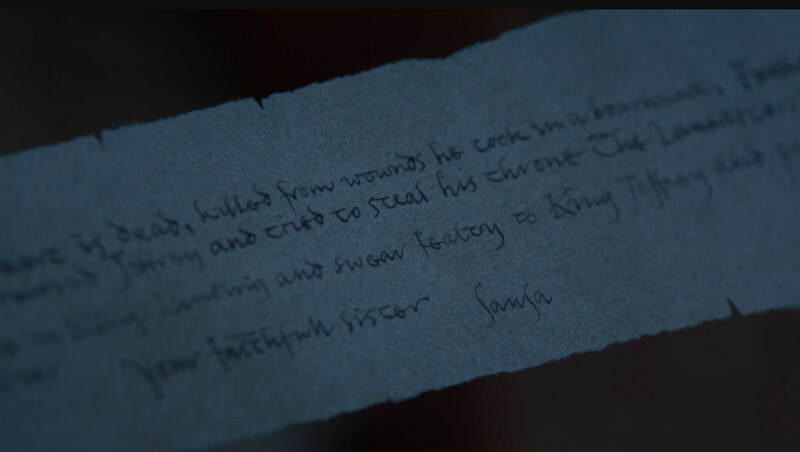 That it is quite a bit neater and more regular than Ned’s handwriting above (or Theon’s scrawl below) suggests that King’s Landing and the general south of Westeros have access to more refined, up-to-date script practices. Letters: Perhaps Handwriting Varies by Region? Theon gives us our most interesting and distinctive script. The many cursive (joined up) elements, vaguely crabbed letter heads, and expressively loose ascending and descending strokes and flourishes all put us in mind of Medieval chancery scripts, which were used for official documents. Real-world chancery scripts date primarily from the thirteenth and fifteenth centuries onward, depending on region; they indicate a growing, widespread, professional class of scribes and document writers. Does this mean that the Iron Islands (or even Winterfell, depending on where Theon learned his letters) see more documentary production than a bustling metropolis like King’s Landing, or has this merely been adopted as a less regular regional style? This is probably the closest to the fine writing in the Book of Brothers or the dragonglass book. More ligatures and irregularities (as well as curved-stroke d) suggest a slightly less formal and/or older style. This is a far more obvious product of a quill pen than the consistent, uniform thickness of strokes in the Book of Brothers. Letters: Does handwriting vary with age? Lyanna Mormont is just a child in season five (albeit feisty beyond belief! ), and her handwriting certainly reflects her youth. Any modern five year old could produce similar letter forms. However, we therefore know that on top of her general badassery, little Lyanna also writes her own letters, instead of relying on an older councillor or a maester. Again, Sansa’s hand is a little less regular and spindlier than those of the adults we have seen. Given that this is Sansa in Season 1, we are not surprised at the idiosyncrasies. On the other hand, Sansa, under extreme pressure in the wake of her father’s arrest, still writes more in a standard southerner-style Humanist minuscule than her fellow northerners Lyanna or Theon. All the manuscript scripts appear to essentially be the High Medieval Gothic textura or a later Humanist writing style. This means that even if records of the Dawn Age and the Long Night were first set to parchment thousands of years earlier, people (presumably maesters at the Citadel) are still reading and copying them in or near the present of the narrative. If they much predated the present, we might expect a script closer to that seen in Western Europe in the Early Middle Ages, in an uncial, half-uncial, or minuscule style. This could look like 'Caroline' minuscule (aspects of which survive in the Humanist minuscule of the show, as exemplified by the a with an upper top stroke), or 'English Square' minuscule (also represented to some degree in the series by the the curved top d). 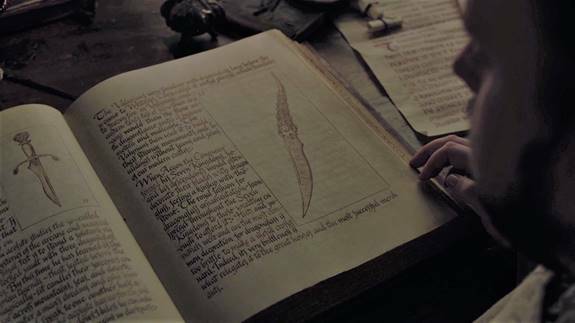 Even without the real world parallels, handwriting we see in the present in letters and documents indicates a messy but general progression towards late medieval and early modern Humanistic hands, with Ned and Tywin’s hands showing a few Gothic elements or older letter forms, and Sansa’s letter and the Kingsguard chronicle favoring more Humanistic styles. If longer texts did exist in an older script (or if any of the First Men’s “runes on rocks” were extant), it is possible that scribes can no longer read either the language or the scripts themselves, which would be in keeping with the general lack of belief expressed for anything supernatural/suitably ancient by the southern elites of Westeros at the beginning of the series. 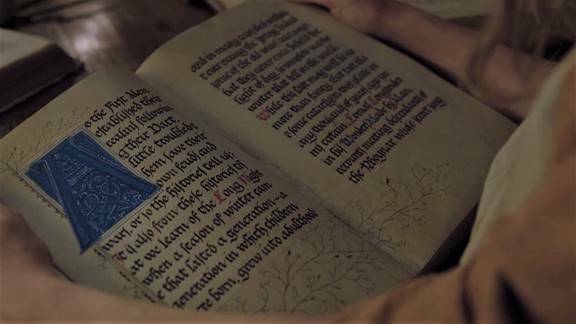 Nonetheless, this seems to contradict the fact that some manuscripts do exist in what must be relatively recent, expensively-produced copies, as well as the Archmaester’s credulous if disinterested response to Sam’s account of the Others. On the level of the study of the physical documents (codicology), the cleanliness of manuscripts and lack of bookworm holes or other signs of vermin also attest to their quite recent production. Given the vibrant colors and illustrations, it is not unreasonable to assume that the books Sam sees at the Citadel were produced for some noble patron, who must have shared this interest. If we were in a charitable mindset, we might suggest said patron was Rhaegar, following up on his literary discovery from Asshai. Perhaps he died before the copies were delivered. If they were intended for anyone else, we must wonder why their knowledge (or belief in the knowledge they convey) seems not to have spread beyond the Citadel library, and even there, not to have inspired much more than vague apathy in the minds of the maesters. Handwriting in letters is wildly inconsistent though it appears that most of the nobility are literate from a young age. 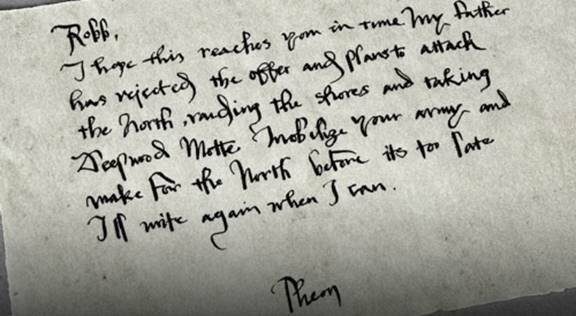 Cursive elements appear in ligatures joining letters, but text entirely in cursive seems unknown (Theon’s chancery-esque hand and Sansa’s letter to Robb come by far the closest). If writing were concentrated in secluded septs around Westeros, it would not be surprising if each location had developed its own house style. However, it is the maesters at the Citadel in Old Town who are responsible for the production of the books we see in the series. This disparity between hands is odd given that all maesters train in the same, single location and are predominantly tasked with education, particularly education of the noble classes. If Westeros followed the model of Western Europe (more specifically the British Isles and Ireland, which generally emerge as clear real-world analogues of the fictional people, places, and events), we might expect more uniformity in letter forms. On the other hand, the level of overall literacy represented is perhaps closer to that associated with the Renaissance or Early Modern Period: most characters in Westeros and Essos can read (Ser Davos and Gilly, who both learn to read in the course of the series, are interlopers from other social classes or regions/cultures). 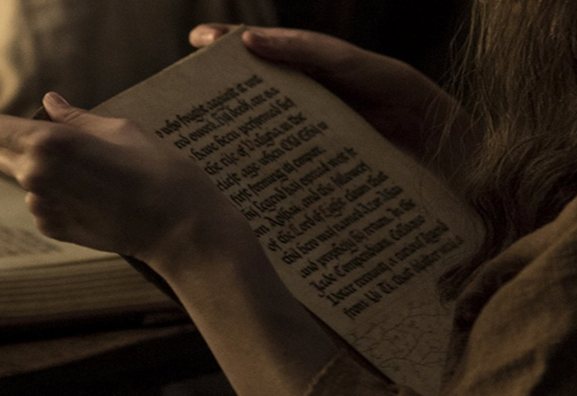 Literacy is common enough that copies of The Seven-Pointed Star (the biblical stand-in gospel of the widespread Faith of the Seven) are mentioned and passages known by heart, and lords and ladies tend to write their own letters and even wills rather than relying on the resident maester (more so in the show than in the books). Perhaps, adjusted for this ubiquity of literacy, the proliferation of personal handwriting styles makes a bit more sense; the value placed on individuality, be it personal acclaim, agency, or distinct authorship seems to have more in common with later periods of European history than Medieval norms. If we are to take any conclusion from this evidence, it should be incredulity at the overall ignorance and disbelief in the Others/White Walkers, dragons, and the supernatural in general given the obvious interest attested by recent manuscript copies and amazingly high level of (at least noble) literacy. Yes, we may call some manuscripts that deal with supernatural themes literature, as seems to be the case with Legends of the Long Night, but literature that matters to someone in a position to expensively rewrite or recopy it nonetheless. 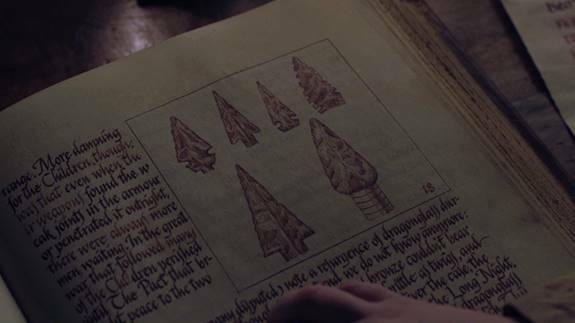 The dragonglass book on the other hand is a far more historical text, and also exists in what seems to be a very modern copy, complete with pictures of weapons apparently made by the Children of the Forest. Again, if that much is accepted as fact and attested in such an expensive, recent manuscript, why the greater disinterest in and disbelief in rumors and first-hand accounts of the supernatural? Westeros has not forgotten its past, and neither is it illiterate; it merely fails to connect the two with any critical thinking abilities. Or, of course, we can just blame HBO’s research skills. Latin Palaeography by Bernhard Bischoff, trans. Daibhm O. Cróinin and David Ganz, 1979. The World of Ice and Fire by George R.R. Martin, Elio M. García Jr. and Linda Antonsson, 2014. There’s something enticing about the very name of the Empire of Trebizond – it flows off the tongue, and conjures images of the far-away and forgotten past (images familiar to any readers of Rose Macaulay’s The Towers of Trebizond). There is, however, a lot more to the late Byzantine state of Trebizond than the dreams of occasional early twentieth century travellers and romantics – whilst this fascinating realm was never very large, it lasted an impressive 250 years as a Greek-speaking post-Roman state perched on the northeastern coastline of Anatolia. 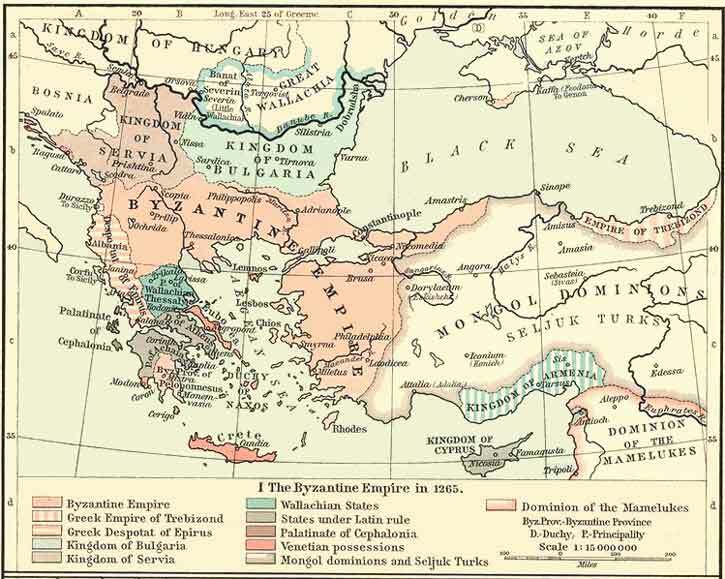 The Empire was founded by two grandsons of the deposed Byzantine Emperor Andronikos I, a mercurial character whose life mostly involved sleeping and fighting his way around and beyond the Byzantine world and whose usurpation of the throne in 1182 led to a brief, bloody three year reign that culminated in his being physically ripped apart by the Constantinopolitan mob. His two grandsons, David and Alexios, grew up in Georgia thanks to their relation to the Bagrationid royal family there, and in 1204, with the unstable reigns of the Angelos dynasty in collapse, they launched a campaign against the tottering Empire. It’s a point of debate what David and Alexios wanted to achieve in the Empire, with scholars split between those who think a breakaway principality was the goal versus those who suspect that they hoped to use of the political turmoil to seat Alexios on the Imperial throne. Turmoil it certainly was - they must have initially intended the campaign to be against the Angeloi rulers, but whilst their campaign was underway the Latin forces of the Fourth Crusade captured Constantinople, creating an unstable Catholic principality around the city and an even more unstable power vacuum in which multiple claimants vied for the throne. Either way, David spearheaded a rapid campaign along the north Anatolian coast backed up by Georgian forces, which was eventually halted by a rival Imperial claimant, Theodore Laskaris, just a few days' march from Constantinople. Many of these early gains, which alongside almost the entire south Black Sea shore included parts of the Crimean peninsula to the north, were lost over the next two decades. The Empire stabilised its borders in its eastern heartland (the area shown on the map above), shielded from other Anatolian rulers by the imposing Pontus Mountains and existing as a long, thin strip of land that was both trapped and protected between the mountains and the sea. This, for the next two centuries, was the Trapezuntine realm, a land where a patchwork of fishing, farming, and light industries like iron production were efficiently exploited to the benefit of the Emperors whose little string of ancient coastal towns formed the last testament to their family’s once world-encompassing ambition. These towns, along with a wide array of smaller villages and monastic communities, probably mostly communicated by sea; the rugged shoreline terrain cut them off from one another by land. The jewel of the Empire was of course Trebizond itself, a vital trading port and fortress that linked the Black Sea inland to Armenia and Persia. Whilst the majority of the Empire’s economy, like in almost all medieval states, lay in extracting resources from the land, Trebizond’s status as a trading centre was never forgotten by its rulers. They gained a good deal of useful revenue from regulating the city’s ports and markets, and navigated often tense relations with Italian merchants who had their own ports near the main city. The cult of Trebizond’s patron saint, Eugenios, was revived and patronised by the Trapezuntine rulers, who put the saint’s image on their silver coins in an attempt to bind their geographically fragmented realm together. So valued were these early aspers of Trebizond that imitations of the originals were being used in nearby countries even after the Trapezuntines changed their own minted coins. Eugenios was, for inhabitants of the city, more than a distant figure of worship: the name was one of the most common to give babies born in the city, and numerous miracles attributed to the saint are recorded from during the period of the Empire. Alexios II, who ruled in the late 13th century, was later said (in a tale with echoes of Saint George) to have fought and slain a dragon with the saint’s divine help, up in the rugged mountains of the Pontus – and perhaps, for the Trapezuntines who dwelt in their high shadow, that might have seemed half plausible. In truth, dragon-slaying was far from the finesse needed from a Trapezuntine ruler. Their nearest co-religionists were the weak states of Georgia (its power shattered by the Mongols after the 1220s) and Byzantium (which never recovered to its pre-1204 glories), so the rulers of Trebizond had to play a delicate game of diplomacy with the various Turkish rulers of the Anatolian plateau. Their greatest assets were often the daughters of their house, many of whom found themselves sent to marry a suitable Turkish or Georgian prince and secure one vital alliance or another. They were consummate survivors, and though their forces and fortresses saw regular action their preferred weapons were always a bridal bed and a chest of coin. They survived the Mongol invasions, the Black Death, Timur the Lame, and over two centuries of the divided, fractious politics of northeastern Anatolia; an impressive feat for a realm so precariously balanced between land and sea. It was after the rise of the Ottoman sultans that the days of Trebizond’s independence became truly numbered. In 1453, after the fall of Constantinople, Trebizond’s position was more dependent than ever on a fragile network of alliances with the remaining independent rulers of northeastern Anatolia. In 1460 the Ottoman vassal-rulers of southern Greece, members of the Byzantine Palaiologan family, had their territories annexed; in the same year, John IV of Trebizond died, leaving his carefully constructed network of alliances between Turk, Greek, and Georgian alike to his younger brother David. These alliances, however, proved no match for Sultan Mehmet II. 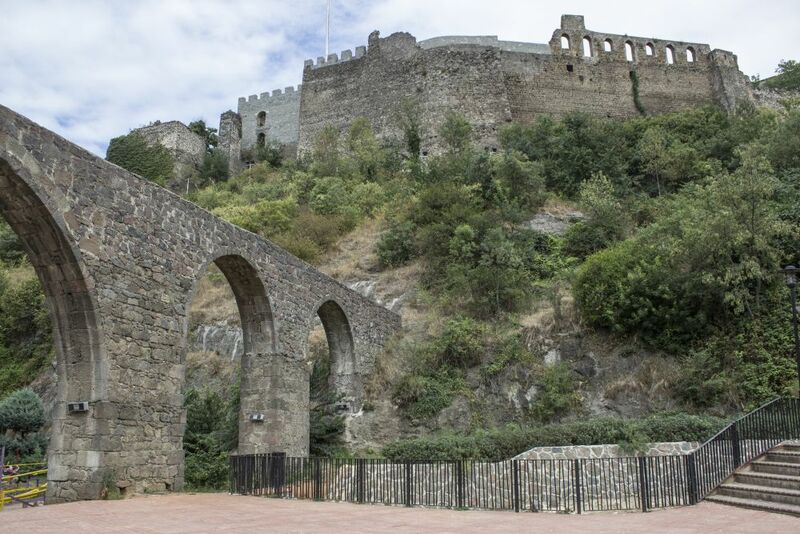 In 1461 he revealed his goals by terrifying the Muslim ruler of Sinope, the best sheltered port on the southern Black Sea shore, into surrendering the city. Despite Sinope’s powerful fortifications and large garrison, no ruler wanted to be besieged by a Sultan who just seven years earlier had breached Constantinople’s famed triple wall for the first time in a thousand years. Mehmed then set his mind to the most dangerous of Trebizond’s allies, Uzun Hassan, the husband of David’s niece Theodora and ruler of the Aq Qoyunlu (sometimes known as the White Sheep Turks) who dominated much of what is now Iraq, Iran, and the southern Caucasus. Mehmed offered peace talks to the Aq Qoyunlu – but on the condition that Trebizond was excluded. Hoping this would be enough to isolate Trebizond, he headed for the city. We will never know what would have happened if David had decided to fight (or if an assassination attempt on Mehmed, which may have been Uzun Hasan’s doing, had succeeded) – hoping to save his family, he surrendered the city in August 1461 on the promise of a pension and estates in Thrace. Mehmed took 800 children to raise as new Ottoman janissaries, and relocated and split the population to prevent further rebellion. David had tragically miscalculated. As the heirs of Rome, his family were too strong a potential set of figureheads to be allowed to remain alive, and Mehmed searched for a pretext on which to have them executed. In 1463, in Constantinople - the city his ancestors had failed to capture a quarter of a millennium before - the last ruler of Trebizond was put to the sword alongside his sons. Trebizond is little known and little-memorialised, beyond vague references in The Towers of Trebizond and in a few somewhat obscure historical novels. This may be because it's one of those places in history that almost nobody today feels a sense of ownership over, thanks to the 20th century removal of the Pontic Greeks, many of whom were forcibly resettled in northern Greece. Nonetheless, it's always fascinated me, and I wanted the chance to introduce you to it as well. It's a setting of contradictions: tiny and yet an Empire, exploiting the land and yet facing the sea, proudly Orthodox yet navigating a world of Turkish Muslim politics. Such a rich, unusual balance of place, power, and culture perhaps deserves rather more attention than it has done in the past, and to be drawn out of the dreams of century-old novelists and into the imaginations of today. So, next time you want some history to read, or some inspiration to write, remember the little Empire of Trebizond clinging to its rocky coast. Who knows - there might even be dragons in the mountains above. Hello everybody! My name’s Daniel, and I’m currently two and a half years into creating a computer game in my free time. The game is called Innkeep. 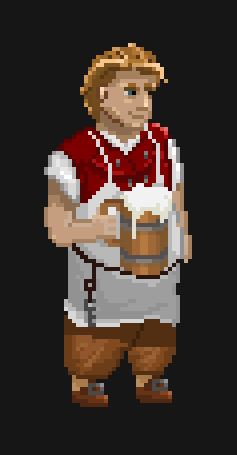 You play as an innkeeper in a low fantasy world. 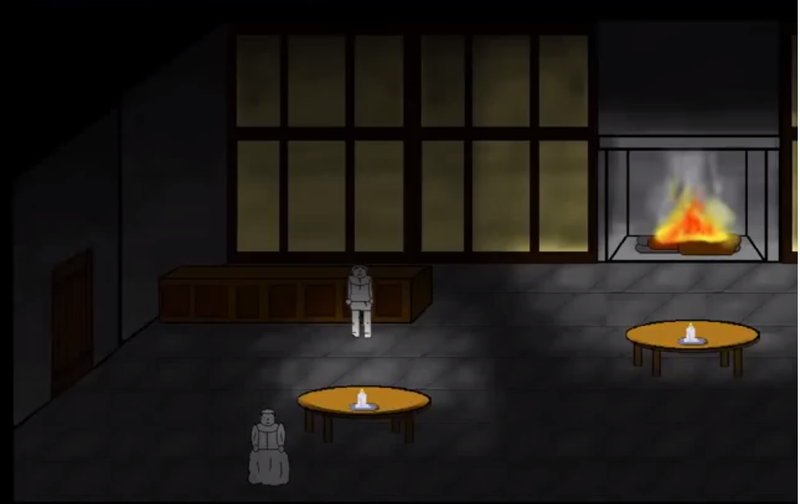 The idea is that each day you have guests visit your inn. You want everybody to have a good time and stay up drinking in the evening, but you are particularly concerned with figuring out which guest has some nice trinkets on them. If you can get that guest extra drunk it will be easier to sneak into their room at night and rob them! Well, that’s the idea. If you are interested in following the development process, pop on over to www.innkeepgame.com. There is a mailing list you can sign up for if you scroll down towards the bottom. So, Jubal has asked me to write a short piece for you all on a topic of my choosing. I thought I would talk about taking that first step in making a game. As I haven’t finished my game yet I can hardly talk about finishing one! I’ll link to somebody else’s post about that further below. If this is you, then I have one initial piece of advice. Stop caring and just start playing around. Whatever you make will be pretty terrible. And that’s OK.
You will get better! Something which helped me with the process of starting to make a game was prior experience learning a language. Not a programming language, but a regular language. And this was supposedly a ‘difficult’ one that takes people forever. Right from the very beginning, when I first took some introductory classes, I had a feeling that one day I would be good at this language. I was terrible, and my grades weren’t very impressive, and year after year after year it felt like progress was very slow. And then, eventually, I got better. Then better still. Until I pretty much achieved all of my initial goals and expectations regarding competency in that language. But it did take seven years! Along the way I had to learn from my mistakes, and try new approaches. And this is common to getting good at anything I imagine. I’m not suggesting that you will need seven years to make your first game! But getting good at things takes time, and that’s OK. It’s important to learn to be patient with yourself, and be happy with where you are at, while at the same time looking for ways to improve. In the future I might write a few more posts about starting to work on a game, to the extent that I can considering that I am still not exactly a successful developer! I am considering writing a little on the process of thinking up an idea for your game, and how I made some gradual improvements to my terrible drawing skills. If you had some specific things you think I might be able to write about that you would like to see, let us know. Thanks everyone! Here is a very good post about starting and finishing a game, by Derek Yu, the creator of Spelunky. 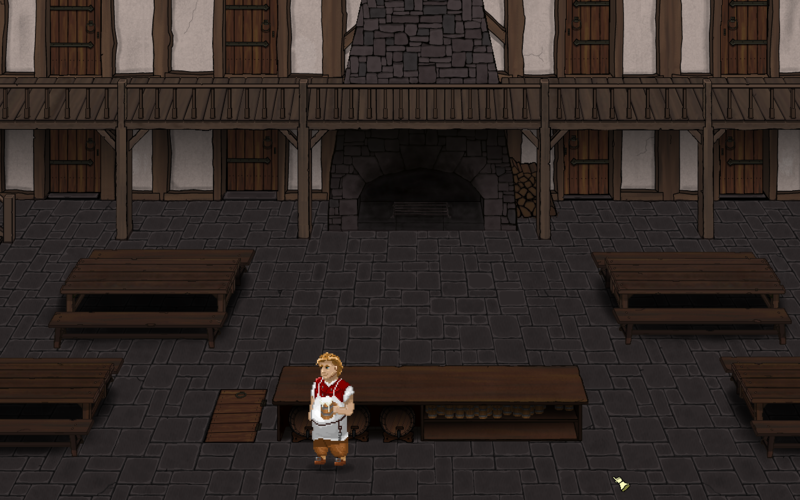 GameMaker is the tool I am using for making Innkeep. It’s quite approachable, and best of all there are a lot of great tutorials on YouTube to get you started. Speaking of great GameMaker tutorials, Tom Francis, maker of Gunpoint, has this excellent series. This is what I started out with myself. Want to start trying to draw your own art? I use GIMP. It has most of the functionality of Photoshop, and it is completely FREE. In this area of Exilian, we'll be providing regular, eclectic, creative, geeky articles and other such content for your reading pleasure. On a weekly basis, more regularly if there's demand, we post a new article here by a member of the community for you all to read. We want to provide a mix of humour, intros or spins on interesting academic subjects, ideas for creativity and project design, showcases of tools and resources, and original creative work. Of course there'll still also be great content being made and written across the forum; Exilian Articles is generally for longer, article-type pieces, whereas game reviews and more high-detailed tutorials have places elsewhere. If you want to write for us, just drop an email to megadux@exilian.co.uk and let us know! Unlike most areas of the forum we'll move or remove new topics posted directly without permission here: this is a "front-facing" area so articles should be cleared with a staff member before being posted. You are of course very welcome indeed to comment on the threads here, and we encourage you to do so: comments here as always fall under the Exilian Terms of Service. Enjoy the articles, and let us know what you think.